How do you rejuvenate a landmark? This week, we visit Rouge, which reopened this week on Rittenhouse Square after a makeover that is at once subtle yet dramatic. Also this week, editor Alison Smith brunches on the Main Line and finds an impressive Bloody Mary bar, while critic Craig LaBan goes down to Georgia — actually a Georgian restaurant in Northeast Philly. Long before Parc and Devon Seafood Grill, Rouge ushered in the city’s era of sidewalk dining two decades ago when it flung open French doors to Rittenhouse Square across 18th Street. Rouge needed a face lift, and it’s reopened after a 10-week renovation under the eye of its original designer. It is serving dinner only, from 5 p.m., but on Thursday, March 21 adds lunch, from 11 a.m. Weekend brunch begins March 30. The results are actually subtle. It feels like Rouge. Designer Meg Rodgers kept the Parisian vibe that she and founder Neil Stein sought back in 1998. But part of the goal was revenue. More bottoms in seats is better for the bottom line. 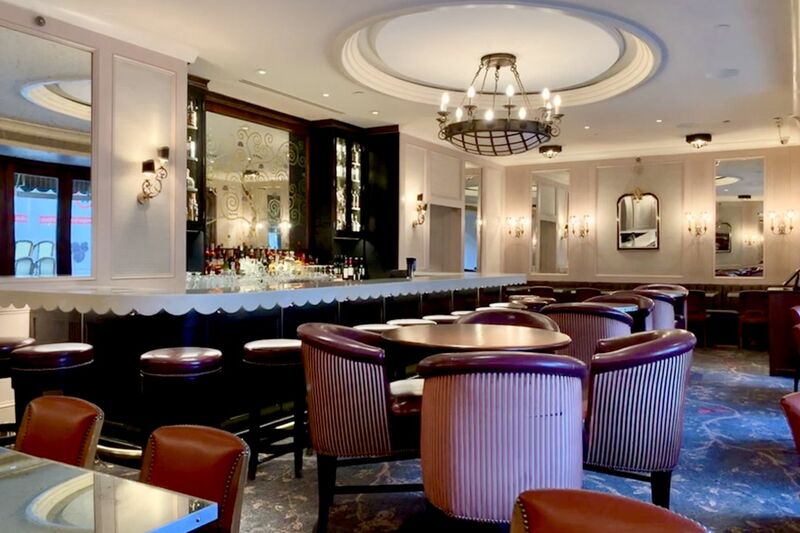 Owner Rob Wasserman, the late Stein's son-in-law, added 22 seats to the 40 seats in the microscopic 750-square-foot dining room as Rodgers repositioned the bar to the rear wall under the existing chandelier. New chef Sean McPaul started with a clean slate. The only menu holdover is the signature 12-ounce, gruyere-topped burger. I run down the menu and the cocktails (created by Hop Sing Laundromat’s Le) here, and chat with Rodgers about the new look here. Michael Schulson goes the boutique steakhouse route at 116 S. 13th St., next to Double Knot and Sampan. Opens March 27. March 21 is the target date for this bruncherie's opening from renovations, at 2212 South St. The syndicated Middle Eastern fast-casual rolls out a new branch March 23 at 3816-36 Chestnut St.
Mark Mebus sets March 20 for the soft opening of his vegan slice shop at 108 S. 20th St. It's running noon till whenever Wednesday to Saturday for the first few weeks. The Plenty Cafe at 705 S. Fifth St. has been retooled into more of a neighborhood bar. It’s open for dinner only through March 22. Weekend brunch starts March 23. On March 26, it goes full-bore, opening daily from 11 a.m. to 10 p.m. Details are said to be forthcoming, but this popular taproom at 17th and Green Streets is shuttered at least for now after a death in the family. "It's a highly programmed space," Melamed writes, advising that you check social media for the best times for Quizzo, shuffleboard and live music. And what to order? She advises you try a pile of barbecue chicken sliders (three for $8) and a heap of pickle fries ($6) for the table, and a pint of local IPA from Levante, Victory, or Dogfish Head ($6 to $8). Read her full column — With the arrival of the Post, Philly has officially reached peak beer hall — here. The Bloody Mary bar at Paramour in Wayne. Paramour, on the ground floor of the Wayne Hotel, serves it all — lunch, happy hour, dinner — but we stopped by for brunch, served on Sundays from 10 a.m. to 2 p.m. Our reason (though does one need a reason for brunch?) was a birthday meal, and we weren't alone — two other tables seated at the same time were celebrating another trip around the sun. It’s a celebratory place. There were fun twists on traditional brunch foods (s’mores waffles, $15; eggs Benedict with default smoked salmon rather than Canadian bacon, $16), and a complimentary appetizer bar. Baker Giorgi Gvelesiani leans deep into a tone oven to bake shoti bread at Georgian Bakery and Cafe in Northeast Philadelphia. Talk about a workplace hazard: Baker Giorgi Gvelesiani leans deep into a tone oven up to 500 times a day to bake shoti bread at Georgian Bakery & Café. The oven is 900 degrees, Craig LaBan writes in his two-bell review, and Gvelesiani resembles a gymnast as he half-flips himself over the side wall deep into the dome-shaped furnace to smack the oblong dough against the searing hot stone. Of course, you must try the shoti, one of Georgia’s essential dishes. But LaBan says the restaurant dedicates an entire menu section to other dough products, and the cheesy khachapuri breads "are the real showstoppers." It's BYOB, and it's very loud, LaBan warns. So sit close if you want to chat over your khachapuri. Questlove will sell a plant-based cheesesteak at Citizens Bank Park, made with Impossible meat. Don't forget to get your free water ice today!